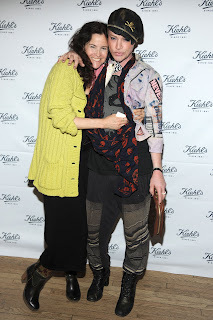 On April 22nd, Kiehl's Since 1851 celebrated Earth Day and the launch of a Limited Edition Collection of Açai Damage Protecting Toning Mist, with 100% of the proceeds benefiting the Rainforest Alliance. The party was held at the Kiehl's Flagship store at 13th St. and 3rd Ave., hosted by model Malia Jones, United States Amateur Surfing Championship winner, and collaborator on the Limited Edition Collection, Chris Salgardo, President, Kiehl's USA, and Tensie Whelan, President, Rainforest Alliance. In addition to Malia Jones, Jeff Koons, Julianne Moore and Pharrell Williams also partnered with Kiehl's to create unique Limited Edition labels for Kiehl's Acai Damage Protecting Toning Mist. VIP guests included Parker Posey, Ally Sheedy, Adrienne Bailon, Heather Matarazzo, Shiri Appleby, Tinsley Mortimer, Kelly Bensimon, Kimberly Stolz, Robert Verdi, Phillip Bloch, Richie Rich, KAWS, Norman Reedus and Celebrity DJ Taryn Manning spinning the beats. Attendees enjoyed Brazilian Açaí Berry-accented treats and cocktails from Van Gogh Vodka (the Acai-Blueberry vodka was yummy), while viewing the Limited Edition Collection and accompanying in-store images shot by David LaChapelle. Upon leaving, guests received a gift bag filled with Kiehl's Acai products - Damage-Minimizing Cleanser, Damage-Preparing Serum, Damage-Correcting Moisturizer and Damage-Protecting Toning Mist. A delicious cake-like Creme de Cookie from Milk & Cookies Bakery was also included - I definitely recommend cookies from that place!